"After a rip snorter of an Every Woman Festival last year, we can't wait to play all the new hits for you tomorrow night at Sydney's hottest new club, Blue Beat! 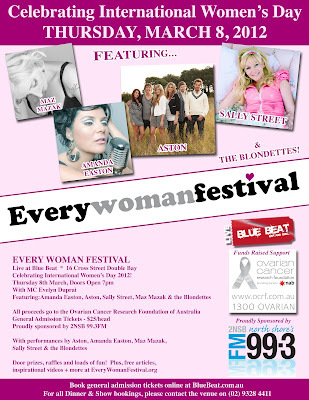 Come and support ovarian cancer research with 5 awesome original Australian bands and celebrate International Women's Day! I have promised to wear hotpants, red FMBs and a black faux ostrich!! (I'm not kidding! *giggle*) performing a new original set with my gorgeous boys who drip with talent (Gerard Masters, James Muller, Alex Hewetson and Fabian Hevia) and also a new dancing member of our band - dancer for the rock stars, Miss Charlotte Howells!" Watch Sally's raunchy new "raw indie-art" Vampire music video: "Without You"
Gulp down the popcorn! Cover your neck and enjoy! Have a snoop around for all the latest Sally Street gossip about "Love Is Like A Bindi-eye" being placed in a new Ozzie-Afghan feature film, "Lexi" soaring up the pop-jazz charts to number 3 in GERMANY!, the new single "Love Tequila" to be released next week, Sally's latest guest appearance on the Smiths Crisps TV commercial with Steven Curry from "The Castle" and more!